GMC has taken its trucks into a new wind tunnel lab to learn exactly how to smooth the way the workhorses slide through the air, learning some surprising truths in the process and debunking the Top 4 Myths of truck aerodynamics. 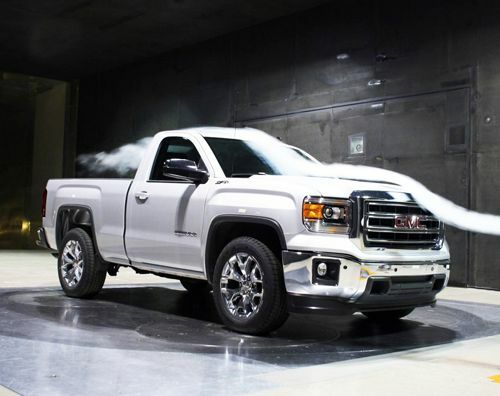 GMC has conducted wind tunnel tests to boost the mileage of the new full-size GMC Sierra pickup, using a state-of-the-art Aerodynamics Lab. The facility is a 750-ft long tunnel with a 43-ft fan that produces wind speeds up to 138 mph. GMC’s efforts revealed the could reduce the drag from the 2014 Sierra’s front bumper by adding an air dam beneath to direct air down towards the ground, thus below the truck’s rough underbody. A ducted flow between grille and radiator keeps air from impeding forward motion with eddies within the truck’s front cavities. Wind tunnel studies even helped sculpt the Sierra’s tailgate and the top mounted brake light to guide air crisply about the truck. Since Bloch’s team found unwanted air streaming between the cab and bed, sealing was added to thwart it. False – Bloch discovered that air flowing over the tailgate pushes forward on the truck. With the gate down this benefit is lost. False – Hard bed covers have some benefit but soft covers or tonneaus have even more, allowing the air to form its own path of least resistance. False – Round tube style running board have a slight benefit but flat running boards build into the body and frame greatly smooth the flow of air about the truck. Furthermore, accessories like bug deflectors wider tires or aftermarket bumpers can negatively impact airflow, resulting in added noise and increased fuel consumption, according to Bloch. The 2014 Sierra half-ton pickup boasts all-new powertrains and design, and the Sierra Heavy Duty pickups are the most capable and powerful trucks ever built by GMC. In addition, they now slice through the air better than trucks ever have before, thanks to wind tunnel research and inquiring minds like Diane Bloch's.